Living in Rome, it’s easy to get used to all the history there is around me. Pantheon? Seen it a million times. Colosseum? Yep, pretty cool I guess. But every now and then I visit something that completely blows me away – this is how I felt when I visited the Basilica of San Clemente. 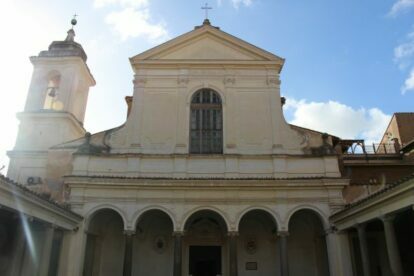 San Clemente is a church that looks just like any other in Rome – just down the road from the Colosseum and the Forum and easily overlooked. If you go in, it’s just like any other Italian church, with gold mosaics, frescoes and a beautiful peaceful courtyard. But if you go underneath, that’s where the real magic starts – there are actually three levels, and you can go down into the ruins and see them all. The deepest level dates back to the 1st century, with an altar used by the cult of Mithras. There’s running water, showing how far down you are and taking you back to what it must have been like there all those years ago. Up a level is another impressive church, used between the 4th and 9th century, with high ceilings and well-preserved frescoes. Then you go up again and you’re back in the ‘modern’ church, blinking in the light, before stepping out of the church’s walls and back in the midst of the chaos of 21st century Rome. It’s a great experience, with as much history and architectural wow as the better known sites in Rome – but without the crowds of tourists.